Marvel Studios may be MIA, but that doesn’t mean Marvel movies are completely absent from San Diego Comic Con 2018. Chief among them is upcoming movie Venom – the Spidey-verse anti-hero with a penchant for biting people’s heads off, and soon-to-be star of his own solo feature, who made a gloopy black splash in Hall H on Friday night. During a 30-or-so-minute panel director Ruben Fleischer, Tom Hardy, and Riz Ahmed (with a shock of blond hair) talked up the film’s comic book inspirations (“We stay pretty close to the Lethal Protector,” said Hardy), the surprisingly sweet reason Hardy first considered the role (his young son is a huge fan), and brought some exclusive new footage to show the 6,000+ attendees. 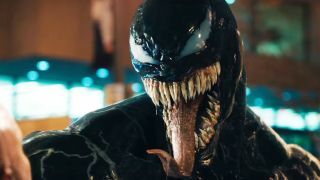 Assembled into a trailer-like sizzle reel (with VFX work still be be completed, according to Fleischer), we got some big new glimpses at Venom in all his gargantuan symbiote glory, Venom emerging tentacle-like from Brock’s body and talking to the investigative journalist, and the alien parasite repairing Brock’s broken body after a nasty injury. We also got our best sense yet of just how wicked (and juvenile) Venom’s sense of humour is - at one point he threatens to bite a criminal's arms and legs off then roll him down a hill “like a turd in the wind”. The biggest reveal came in the form of Riot – another symbiote who, unlike Venom, doesn’t latch onto a single human, but hops between hosts in the film, meaning anyone is a potential enemy, including Ahmed’s Life Foundation figurehead Carlton Drake. Bigger, stronger, and way uglier than the lethal protector, he boasts two cleaving axes for hands and, in a dazzling slow-mo hero shot, has a pretty decent stab at ripping Brock and his symbiote apart. But Riot wasn’t the only new symbiote on display. Though not officially confirmed on stage, it looks like Agony will also be appearing, a female security guard glimpsed transforming her arm into a blade (not dissimilar from the T-1000) and then firing prehensile hairs out of her back and killing everyone in the vicinity. With unseen, but hinted at, moments of head-munching, and Fleischer claiming, “There are no heroes in this film,” Venom presents a very different prospect for superhero cinema, and it’s one with ambitions beyond a single feature. “We’re definitely planning a huge world with this Venom story,” said Fleischer. The panel also addressed the spider-shaped elephant in the room during the closing moments. With Venom’s origin inextricably linked to Peter Parker in the comics, is there any chance we could see Tom Holland’s web-slinger on screen again this September? “I think we an all agree it would be pretty amazing to see Spider-Man and Venom face off in a film,” said Fleischer, confirming or denying nothing. “I have to think the studio’s thinking the same way and, at some point down the road, they’re going to run across each other’s paths.” Tom Hardy was then asked if he’d like to fight Spider-Man, a question he answered amusingly literally, “What, go toe-to-toe with Tom Holland? I’ll have a go, yeah. You’ve got to have a go, ain’t yah.” So while it’s very (very) unlikely that Spidey will swing into Venom, don’t rule out a showdown in the distant future. Watch every San Diego Comic Con 2018 trailer - from The Walking Dead to Doctor Who.